Take Route 95 North to Route 287 West. Stay on Route 287 West for approximately 12 miles to Exit 2 (Elmsford). At the light at the bottom of the hill, make a right onto Route 9A North. Go approximately 2 miles and make right at light into Cross Westchester Executive Park. Go about 1/8 of a mile and make a right onto Westchester Plaza. Napco is building #1, the last building on the right. Take the Hutchinson River Parkway North to Route 287 West (towards White Plains). Get off at Exit 2 (Elmsford). At the light at the bottom of the hill, make a right onto Route 9A North. Go approximately 2 miles and make right at light into Cross Westchester Executive Park. Go about 1/8 of a mile and make a right onto Westchester Plaza. Napco is building #1, the last building on the right. Saw Mill River Parkway South to Eastview Exit. Make left at light. Stay to the right and follow sign for Route 9A South (bear right). Make left at light into Cross Westchester Executive Park. Go about 1/8 of a mile and make a right onto Westchester Plaza. Napco is building #1, the last building on the right. You can either take the Meritt Parkway, Boston Post Road, or Connecticut Turnpike West to Route 287 West. Get off of Route 287 at Exit 2 (Elmsford). At the light at the bottom of the hill, make a right onto Route 9A North. 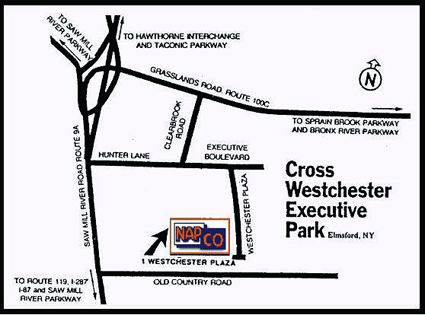 Go approximately 2 miles and make right at light into Cross Westchester Executive Park. Go about 1/8 of a mile and make a right onto Westchester Plaza. Napco is building #1, the last building on the right. Go over bridge to the NY side. Stay to right and get off at exit No. 8 to Route 287 East (NOT Rt. 87 South). Get off at exit 1 and follow the Saw Mill River Parkway North for approximately 2 miles to Eastview Exit. Make right at the light and follow signs for Route 9A South (right lane). At first light make right into Cross Westchester Executive Park. Go about 1/8 of a mile and make a right onto Westchester Plaza. Napco is building #1, the last building on the right.